Gathering space for General Chapter, 2015. 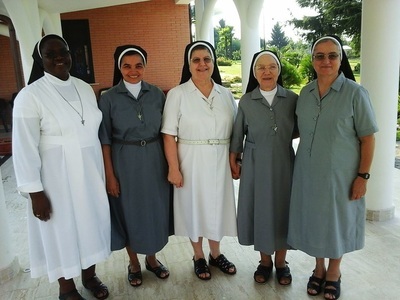 ﻿Newly Elected General Council ﻿ (l to r): Sr Pauline Kasila (Congo), Councillor; Sr Anacleta de Arujo Ferreira (Brasil), Councillor and Bursar; Sr Tessie Bezzina (Malta), Superior General; Sr Eugenia Silvestri (Italy), Vicar General; Sr Ninette D'Amato (Malta), Councillor and Secretary. Congrats and God bless you all.